On my current training tour, my teaching pistol is a compact 9mm semiautomatic, the SIG-Sauer P239. It’s utterly reliable, and more than accurate enough for demonstration purposes. However, all products including firearms have their idiosyncrasies, and this pistol has one that it shares with some of its stablemates from that period of its production: the screws that hold the grip panels in place work loose with shooting. 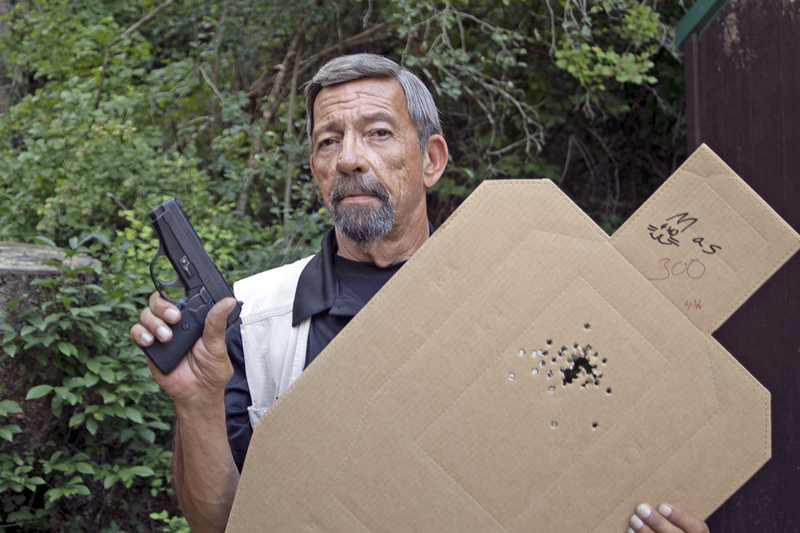 When shooting the pace-setter drill in Idaho, where we on staff demonstrate the qualification course to the students, I felt the grip panels on the P239 coming loose. I didn’t have a screwdriver with me; we had flown out and were traveling as light as possible. I just tightened them down as best I could with a thumbnail, and finished the course. In the past I had found loosening grip screws to be epidemic with the older model SIG-Sauer pistols. 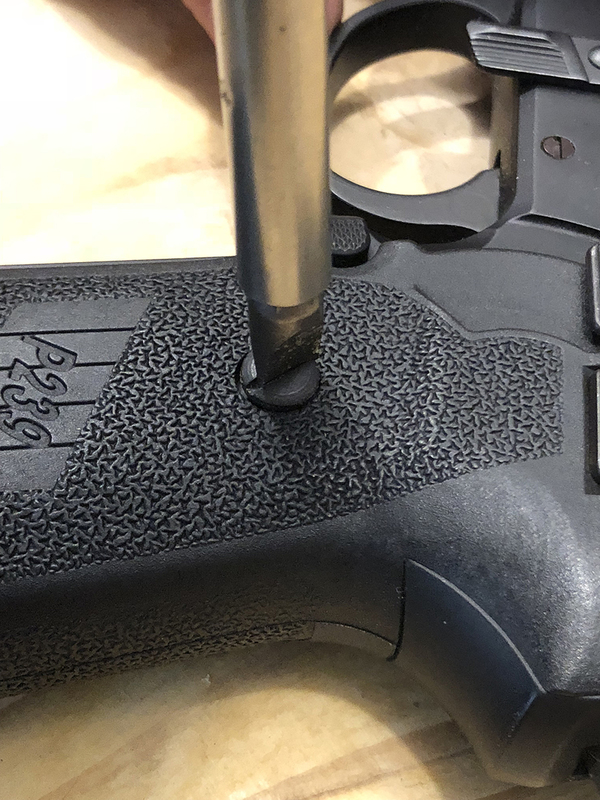 It was solved with SIG’s adoption of their current E2 (“Ergonomics Squared) grips, but I had never seen any of those for the now-discontinued P239. At my next stop, Firearms Academy of Seattle, I asked my host Marty Hayes if I could go into his workshop and tighten down the screws. Marty told me that when he had been at the Gunsite Training Center, the head gunsmith there had taught him that instead of Loc-Tite and such, it was easier and very effective to simply put tiny rubber O-rings under the screw heads. We did that. Et voila: the problem was solved. You’ve heard about the OODA Loop? I found myself in the “Oh. Duh.” Loop. 64 years of shooting guns, and I had never picked up on that. Live and learn. Brother and sister shooters, have you found any cool, simple, effective life hacks “gun hacks” that apply to the world of firearms? If so, you are invited to post them here. Thanks for passing that along. That may be useful in other applications. Nice tip, Mas. You mentioned Loc-Tite – two comments about using that – make dang SURE that you use the blue version if you intend to take off the fasteners since the red variety is almost impossible to dislodge (you’ll only make that mistake once! ); and also use acetone to clean both the male and female threads before applying the Loc-Tite. I use a bit of blue LT on 1911 grip bushing threads where they go into the frame (not for the grip screws!) to make sure the screw and bushing don’t back out together when removing the grip panels. Great! Thank you for passing on the learning. One can always use a lock washer if loc-tite does not work. As it happens I have quite a bit of experience with tiny o-rings, from my other passion, hybrid rocket motors. I highly recommend a very light touch of lubrication on them to keep them from tearing when you tighten the screws down. I have a bit of sponge in a plastic box (one of those blue ones that Midway USA ships bulk bullets in…more cross-pollination) with a layer of lubricant on the surface. Lightly rubbing the o-rings on that does the trick. Case lube would be fine for grip securing purposes. In the rocketry world we use Krytox grease because anything else reacts when you flow oxidizer over it. I carried a Sig 239 .357 the last 2 years before I retired. Still have it, still love it. The hard plastic factory grips, not so much. I replaced them with the Hogue wrap around rubber grips and love them. Never had the grip screws loosen with them. A cheap upgrade I highly recommend. My S&W model 10-6 has a traditional blue finish. After each cleaning I give it a light coat of car wax. The wax gives the finish a nice deep blue mirror look and finger prints wipe right off with a soft cloth.I have owned the model 10 for 40+ years and regular waxing/polishing has prevented surface rust/pitting on the steel. Also, scratch cover polish darkens the nicks and scratches in the walnut grips. I buy them at the local hardware store (Wilco) for a nickel apiece. So simple even I could miss it altogether. My S&W 686+ has some inherent issues with screws unscrewing. For example, the extractor rod always backed out when shooting making it almost impossible to open the cylinder. Gunsmith put some blue loc-tite on it and the problem was resolved. Next issue, but because I shoot .357 MAG rounds just as frequent as all the .38 SPL rounds i send downrange, the mainspring screw works its way out leaving me with a hammer drop that doesn’t go bang (too light). I have had to retighten that screw 3 times in the last coupla years. It is one of my carry/competition guns and I’d like to remedy that particular issue sooner rather than later. I did contact customer service at S&W and they didn’t have any longterm suggestions. Anyone in this forum have any ideas? Thank you in advance. I have experienced the problem you mentioned about the extractor rod backing out, locking the cylinder, with a S&W Model 60. I concluded that even though the gun is a .357 Magnum, it is too small and light to handle a steady diet of that round. Now I just feed it .38 Special. My hand feels better too. I’ve decided to obey the laws of physics, and not try to shoot powerful rounds out of small guns. Generally, Light Magnums, Like the S&W Model 19, tend to shoot many Screws, and Parts, loose on a steady Diet of .357 Ammo, so I usually used the .357 ammo to sight them in first, then fired groups of .38 Spl., to figure out the difference in their Shot patterns. After that I practiced with the .38 Spl. Ammo, but loaded with the Hotter .357, on duty where I wanted the Hotter, faster, Hollow Point Ammo, Should I need it in a Situation that Would Effect MY Life, and Require an Official Report Afterwards, Assuming that I Was Still Around to Write It? PS: Early on our Issue Ammo was .357 Solid Points, with an Oddly Shaped lead Bullet. Later On, We Were Issued .357 rounds with a Brass, Hollow Point Bullet! 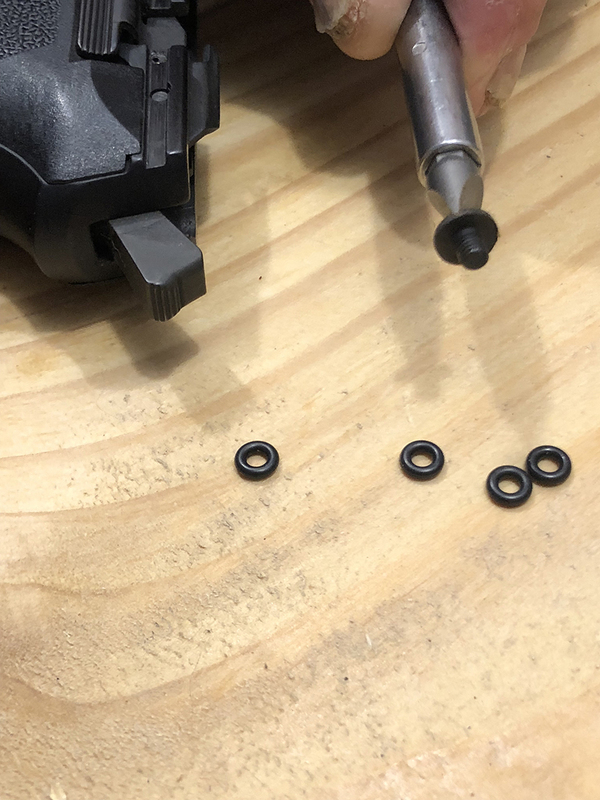 Not so much for screws but tiny hex bolts found on some firearms will fall out of a socket or nut driver when you are trying to start a small bolt. The solution is to find a small piece of plastic, like from a sandwich bag and put it over the socket then push the head of the bolt into it, the bolt will be held in place while you start and tighten the screw. When you pull the socket away the plastic will fall out. This will work with any size bolt. Your wife will think you’ve given up cursing while working on that particular hard to fix firearm. I shot half my qualification with loose grip screws? That may explain some things! Great info Mas!! Learned that trick a few years ago with some 1911 grips that kept coming loose even with blue loctite. No worries ever since and they were cheap enough to get a dozen or so at Lowe’s or Home Depot. Just purchased a set of “thin grips” for my 1911 from V Z Grips. They recommend and sell o-rings on the grip screws. I have not yet shot the gun enough to determine if it works. I have not really had a problem on my other 1911’s that I shoot in IDPA & IPSC. The police and ex cops love these O-rings because they look like delicious little donuts. The favorite breakfast cereal of LEOs is Cheerios for the same reason. I use blue Loctite 242 to keep my gun screws from loosening, but do use O-rings for my weapon lights. I found the rubber gas rings for the Remington 1100 shotguns the perfect size for putting behind the lens caps of my Streamlight M3 lights to keep them from moving under recoil, and they help seal out dirt and moisture too. I need to try this with the screws for my Tucker Gun Leather holsters. I’ve had to retighten the screws on them several times now. I’ve never liked using LocTite on anything I own that I think I might ever want to disassemble, which is nearly everything. Springwashers of various types are OK in many applications, and I use them frequently. One problem with springwashers, excepting the German “warpie washers”, is that they do NOT seal against moisture because of the split, or star twists. The German “warpie washers” are a complete surface, and will seal quite well. Not against fluids under pressure, but most other things. As far as O-rings, absolutely. They DO come in various grades, some of the rubber used is cheap and tends to crack or split over time. Again, the Germans have it, I’ve taken O-rings from thirty year old gearboxes with hundreds of thousands of miles on them, and they are still firm, supple, intact, no cracks or signs of wear. The cheapies at Lowes/Home Cheapo may be a lower grade of material. Worst are the ones in cheap stuff made in China…. like faucets? Advantages of the O-rings: they provide enuogh friction against the bottom of the screwhead to keep it from turning on its own, they WILL form a tight seal between the screwhead and the part being secured, preventing moisture (sweaty hands? Rain?) and thus prevent it from gaining access. And when its time to remove the grip or other bit? They will easily turn back out, and not need their threads cleaned as you’ve put nothing on them. Very much “other” than LocTite. I work on machinery and mechanical stuff constantly and have not used LocTite in many years. Torque to specs in pattern, they won’t come out on their own. Unless yuo RADICALLY overheat it, in which case its coming apart anyway to repair the heat damage. for variable choke tube inserts on a shotgun, use a touch of a “never seize” compound. I like the Marind grade, which has silver instead of aluminium, a bit more dear but under some conditions the aluminium in the regular grade Never Seize can react with water and really create a mess. Just a tiny bit, perhaps a daub with the thick end of a flat type toothpick, scraped across the threads before it is inserted. Tighten down per specs, and when its time to remove it the tube will coe out easily. Even if left there for years. I have a Ruger Mini-30 rifle. As part of field stripping it for cleaning, one must remove the recoil spring. To re-assemble the firearm, the spring must to re-compressed and the end fitted under a large retainer pin. Because this pin fits loosely into its hole (at least in my gun it does) and the spring is under a lot of tension, it almost takes three hands to put the spring back in place. Two hands to compress and guide the spring into position plus a third hand to hold the pin in place until the spring is inserted. Once the spring is back in, spring pressure prevents the pin from slipping back out of place. I have found that a small piece of blue tape can be used to temporarily hold the pin in place. With the pin secure, it is a simple matter to use both hands to compress and insert the spring. Once the spring is back in place, the tape can be removed. This blue tape peals off easily without leaving any glue behind. If you have small parts to keep track of, a strip of this tape can also be used as a “sticky holder” to keep the parts together and prevent them from being lost. Anyway, just a tip that this blue tape can be used for more than just masking off areas during painting. Brownell’s has, at last count, 4 volumes of “Gunsmiths’ Kinks” Exactly this kind of thing for hundreds of firearms. When making up some dummy rounds for practice or to do function checks, I put a glob of automotive gasket maker or other kind of silicone in the primer pocket and firmly set the round base down on a piece of freezer paper and let it cure. After it’s cured, a simple rub of the thumb on the base will remove any excess cured material and there you go! My Sig P 238 grips were falling off also. We used loctite. Issue resolved. Locktite works well when applied correctly. In short, you have to use the right version of Locktite for the right materials (and stress environment) and you have to prepare (clean and prime) the surfaces correctly.